Great web site and real easy to navigate. They even have weekly coupon specials on the site. Then you mix it all up. Ugh...you are sneaking that stuff in my foods. ..tasty, gooey, I love it.. I cleaned the rug and everything. Maybe I could swallow it whole and be done with it.. 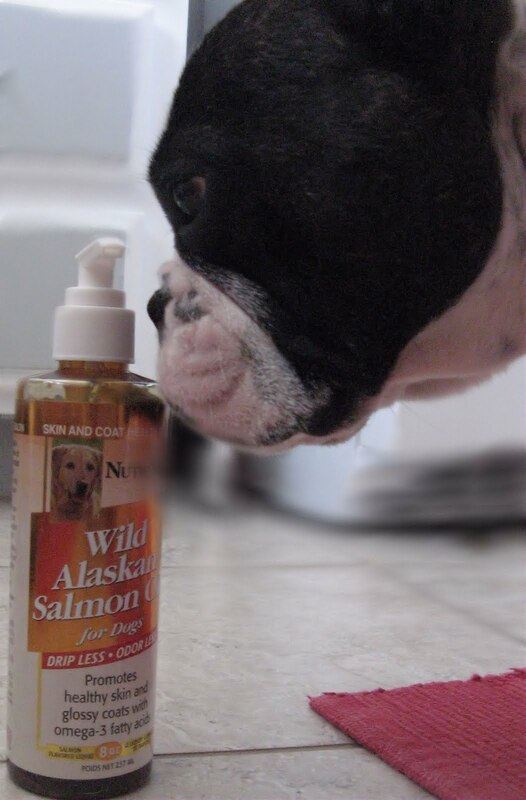 Thank you Ms. Amanda for letting us review the Odorless Salmon Oil. I personally would give it a 4 paws up. Love the gooey consistency of the oil..it is not odorless, but does not smell as "fishy"
as other salmon oil we have used. does not like any extras hiding in her food. Lilly, Phantom is so in agreement with you. TD and Ciara, on the other hand, would love anything you put on their food. We use fish oil capsules but we know wild salmon oil is really good for us too. Thanks for the review. We've used the oils, but mom's found it easier to do the salmon oil caps. Easier for travel and all. I wonder how they get fishes in those bottles and pills? They must be small fishes! Sassy is rather finicky too...the boys would LOVE it!!! Thanks for the info! I'm with you Benny, I will eat anything on my food, including plastic. I am very lucky that my two boys enjoy salmon oil. It has really made a difference for my black pug when he started to get bad dandruff. I switch between salmon oil and coconut oil. The coconut oil is a HUGE hit. Maybe Miss Lil would like that better? Us kitties LOVE Salmon....we've never experienced coconut oil....but that might be a doggy thing????? Good to know! We've been wanting to try it! Hmmm... Mum wants me to try that stuff... but I dont know ... I think Lily and I have the same taste buds! Ick! You are the second dog this week tell me that salmon is good. I may have to try it. We LOVE fish....in fact, we'd like it to smell fishy! Hehehe Lily, that yuck face is priceless.8 would probably like that stuff. Mom says I am like a cat when it comes to all things fishy! I love the flavor of sammin. OoH sounds yummy! Maybe my mom wil gets me some of dat. You sound like me - I eat everything! I am thinking my felines sisters would LOVE this stuff. I am like Benny too! fishy or not... I eat everything! I think I would love it,,, because i like sardines. Good job on the review work! We love fishie thing esp. sardines! 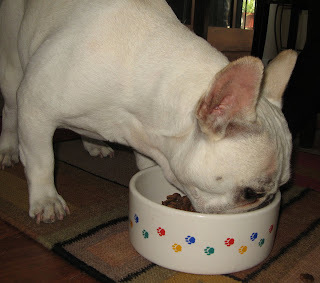 Lilac always knows when Mom or Dad sneak something into her food, too! I don't mind a little extra, myself! 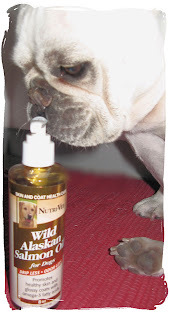 We LUV our Salmon oil! Plus it helps the itchies go bye-bye. Cute review. I'm glad I sent it to you! I'm posting this kind of late but I hope the readers find this coupon code. The coupon code is HALFOFFSO (should be entered in all caps). Expires 8/1/2011. Will give everyone 50% off any of our Wild Alaskan Salmon Oil (regular or the drip less odor less option) for dogs and cats. They will also receive free shipping if they spend $45 or more, otherwise it’s only $5.95. We ship anywhere to the USA. Also, if you have your own blog and wanted to do a product review on dog or cat supplements, please email me at info@bestpethealth.com and introduce yourself.